© 2002, © 2018 by Paul Freeman. Revised 9/23/18. 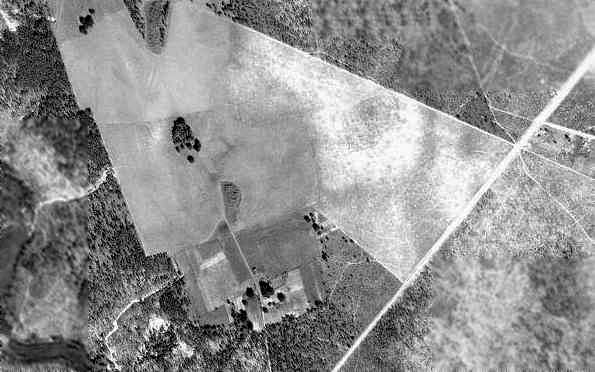 The 1941 USGS topo map (courtesy of Dallam Oliver-Lee) depicted the square-shaped clearing of Olive Field, but did not label the airfield. According to Brian Rehwinkel, “Site 4A (Bureau of Aeronautics # 00313) was a pre-war auxiliary landing field (outlying field) acquired by the Navy in late 1939. The earliest depiction which has been located of Olive Field was on the 1941 USGS topo map (courtesy of Dallam Oliver-Lee). 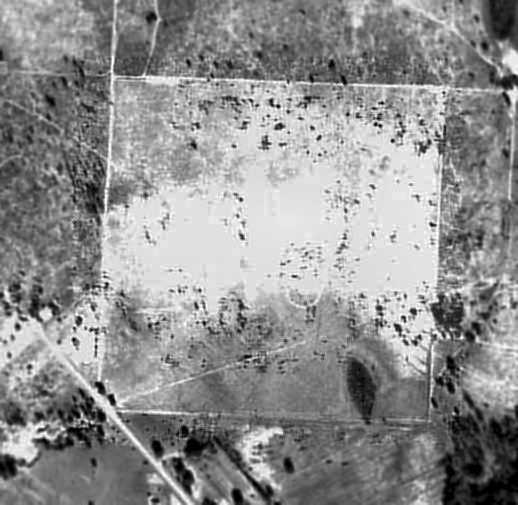 It depicted the square-shaped clearing of Olive Field, but did not label the airfield. depicted "00313, Site No. 4-A" as a square outline. 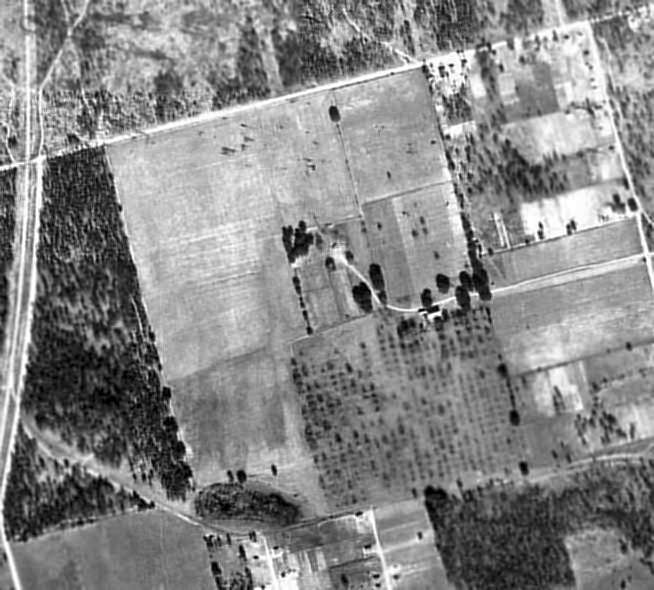 The earliest photo which has been located of Olive Field was a 3/5/43 National Archive aerial view (courtesy of Brian Rehwinkel). Topo maps from 1943 & 1944 depicted depicted the square-shaped clearing of Olive Field, but did not label the airfield..
as a 160 acre square turf field measuring 2,640' each way. The earliest aeronautical chart depiction which has been located of Olive Field was on the July 1945 Mobile Sectional Chart. It depicted “Olive (Navy)” as an auxiliary airfield, surrounded by the amazingly dense wartime assemblage of Pensacola-area Navy airfields. The earliest photo which has been located of Olive Field was a 10/22/55 aerial view (courtesy of Dallam Oliver-Lee). It depicted Olive as being a square-shaped grass field (with a cutout at the southeast corner). Brian Rehwinkel observed, “You can still see the same [asterix-shaped] markings [as seen in the 1943 photo] if you look carefully. 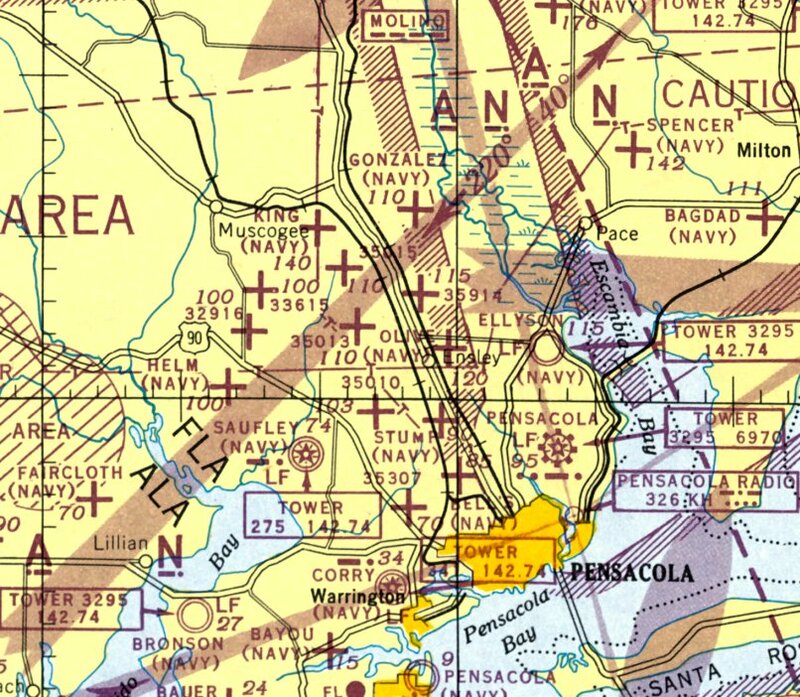 as it was no longer depicted among other Pensacola-area Navy outlying fields on the 1957 USGS topo map (courtesy of Dallam Oliver-Lee). 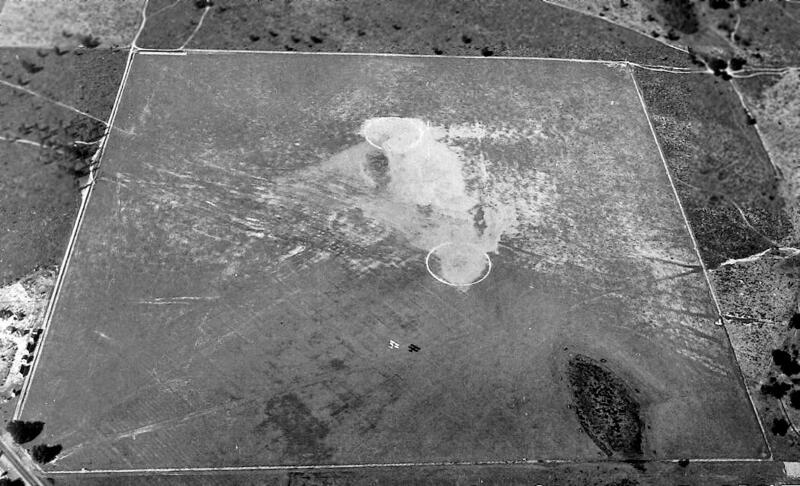 A 10/21/61 FLDOT aerial view (courtesy of Dallam Oliver-Lee) still showed the runway & helicopter markings on Olive Field. The last photo which has been located appearing to still show Olive Field intact was a 2/10/74 aerial view (courtesy of Dallam Oliver-Lee). The field appeared largely unchanged from the 1955 photo. 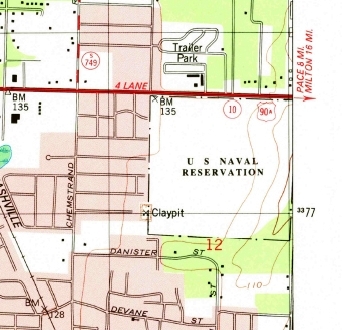 The 1978 USGS topo map (courtesy of Dallam Oliver-Lee) labeled the Olive Field site as “US Naval Reservation”. According to Brian Rehwinkel, “A November 1979 aerial photo indicates that the field was abandoned. 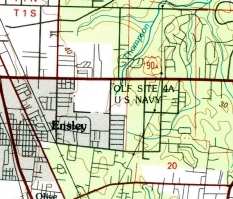 The 1981 USGS topo map (courtesy of Dallam Oliver-Lee) labeled the Olive Field site as “OLF Site 4A US Navy”. showed that baseball fields were being developed on the property adjacent to the east side of Olive Field. 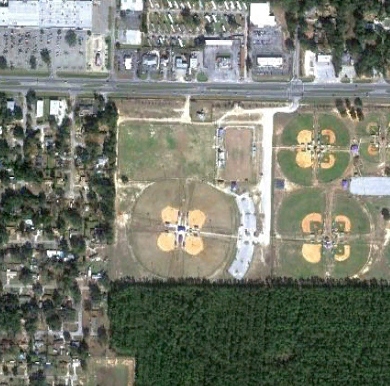 A 1/3/12 aerial view (courtesy of Dallam Oliver-Lee) showed that baseball fields covered the southern portion of the Olive Field site. As of 2013 the site of Olive Field is occupied by Drummond Park. The site of Olive Field is located southwest of the intersection of East 9 Mile Road & Airway Drive. 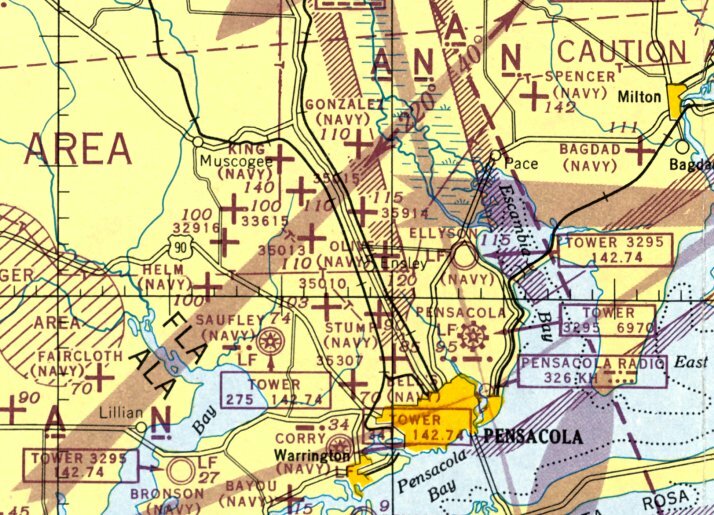 “00017 Gonzalez Field”, as depicted on a 1942 map of Pensacola-area Navy airfields (courtesy of Brian Rehwinkel). to support flight training operations at Naval Air Station Pensacola. just before the beginning of World War Two – in mid-October 1941. Most likely, the field was not used until later in 1941 or early 1942. The Navy acquired 116 acres for this grass airfield. 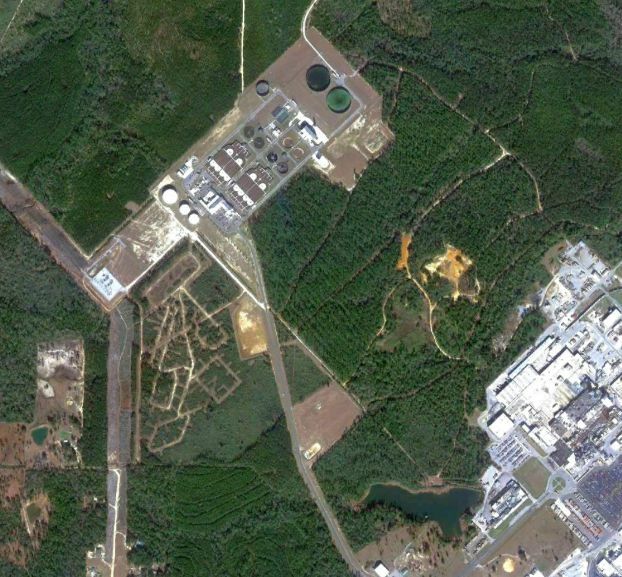 As with Site 4A, Gonzalez OLF was assigned to NAS Pensacola (and later the Naval Air Training Center) for most of World War Two. which depicted “00017 Gonzalez Field” as an irregularly-shaped outline. According to Brian Rehwinkel, “A March 1943 memo states that Gonzalez OLF was being used for emergency landings only at that time. 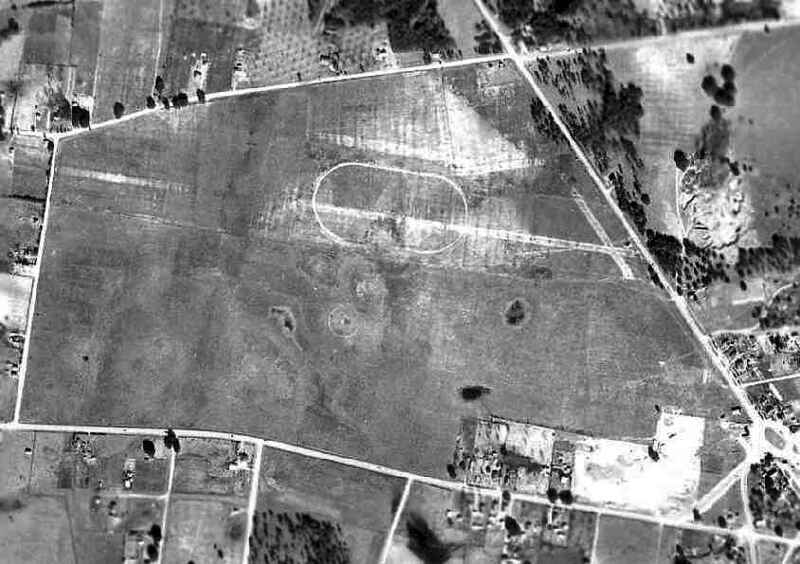 The earliest photo which has been located of Gonzalez Field was a 1943 National Archives aerial view (courtesy of Brian Rehwinkel). 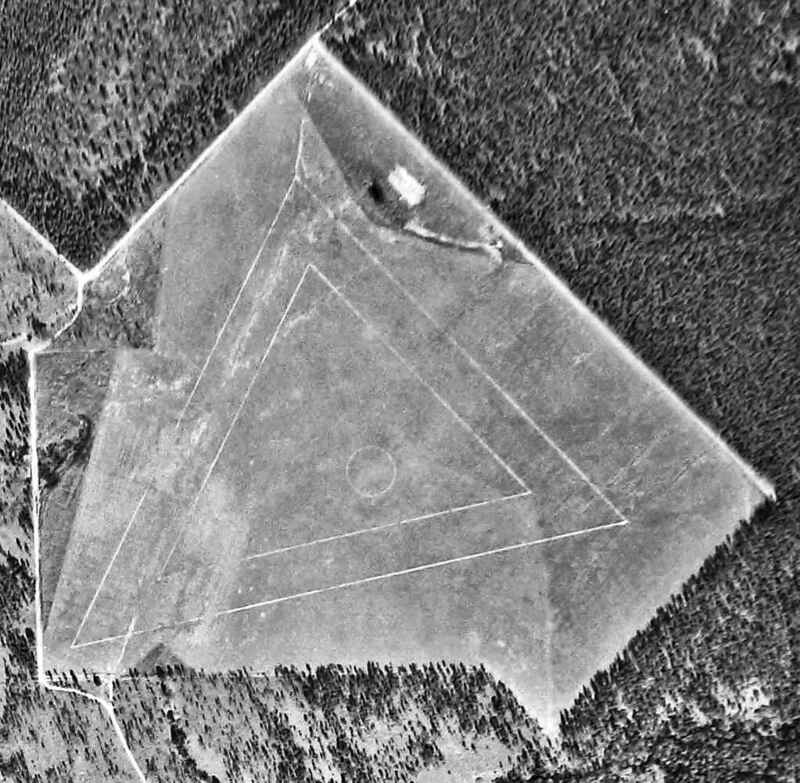 It depicted a triangular set of runways marked out on a grass airfield. Gonzalez Field was not yet depicted on the January 1944 Mobile Sectional Chart. 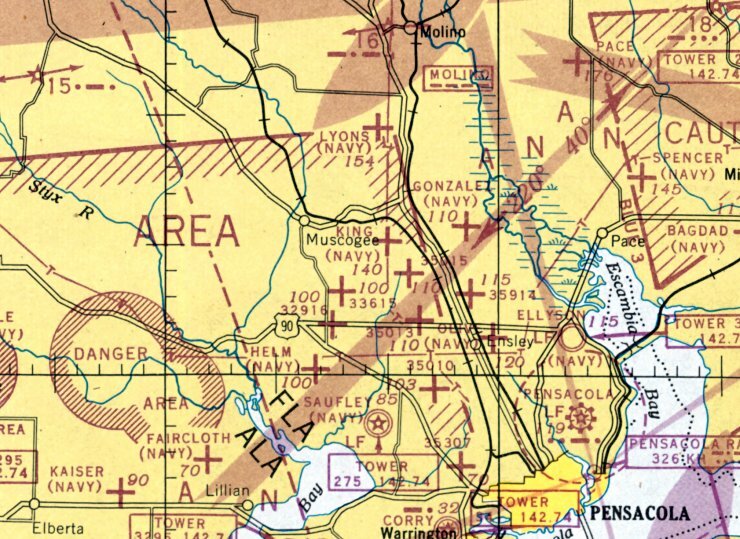 The earliest aeronautical chart depiction which has been located of Gonzalez Field was on the January 1945 Mobile Sectional Chart. It depicted “Gonzalez (Navy)” as an auxiliary airfield. as a 80 acre irregularly-shaped property having a turf all-way landing area measuring 2,640' northwest/southeast. The field was not said to have any hangars, to be owned by the U.S. Government, and operated by the Navy. The last aeronautical chart depiction which has been located of Gonzalez NOLF was on the February 1955 Mobile Sectional Chart. “Gonzalez OLF #5 (Navy)” was depicted as having a 3,800' unpaved runway. According to Brian Rehwinkel, “I don’t know how much Gonzalez was used after the war. It is likely the site was not used much. with the very faint traces of 3 runways marked on the field. According to Brian Rehwinkel, “Gonzalez was declared surplus by the Navy in 1955 & sold in July 1956 to private individuals. 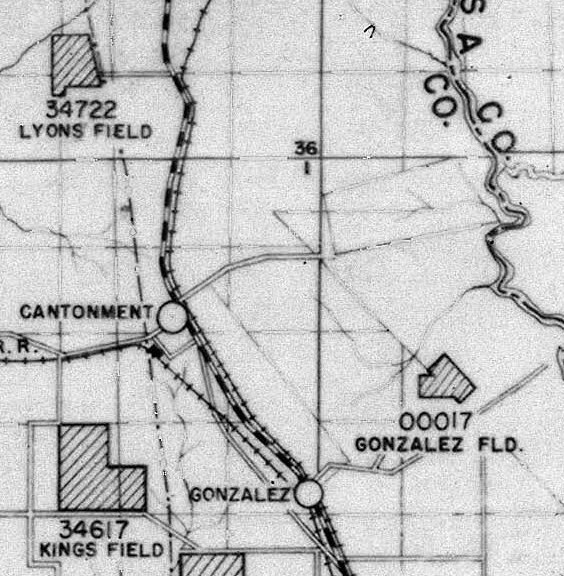 Gonzalez Field was no longer depicted on the 1957 USGS topo map. A 2008 aerial photo (courtesy of Dallam Oliver-Lee) still showed the site of Gonzalez Field to remain an open, undeveloped plot. having been built over the northern portion of the Gonzalez Field site. 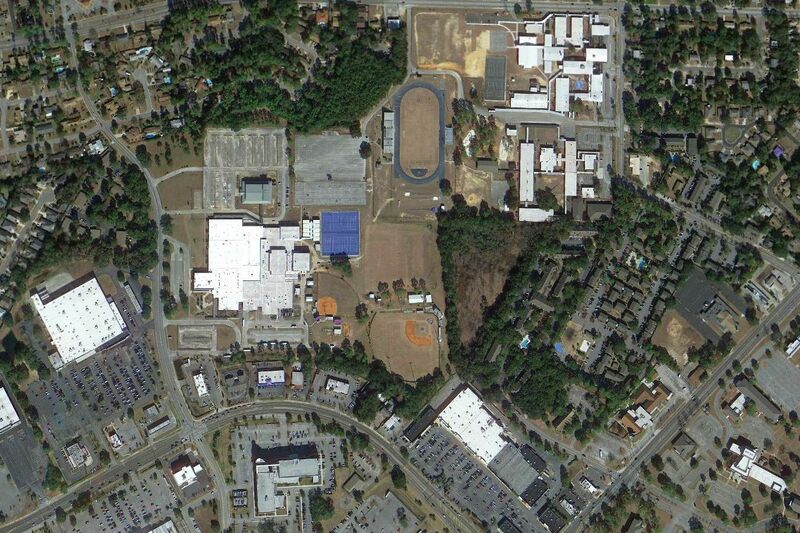 A 1/3/12 aerial view (courtesy of Dallam Oliver-Lee) showed that the outline of Gonzalez Field was still recognizable. The site of Gonzalez Field is located north of the intersection of New Haven Road & Old Chemstrand Road. Lyons NOLF, as depicted on the August 1946 Mobile Sectional Chart. the 1943 USGS topo map, nor the July 1945 Mobile Sectional Chart. which depicted “Lyons (Navy)” as an auxiliary airfield. 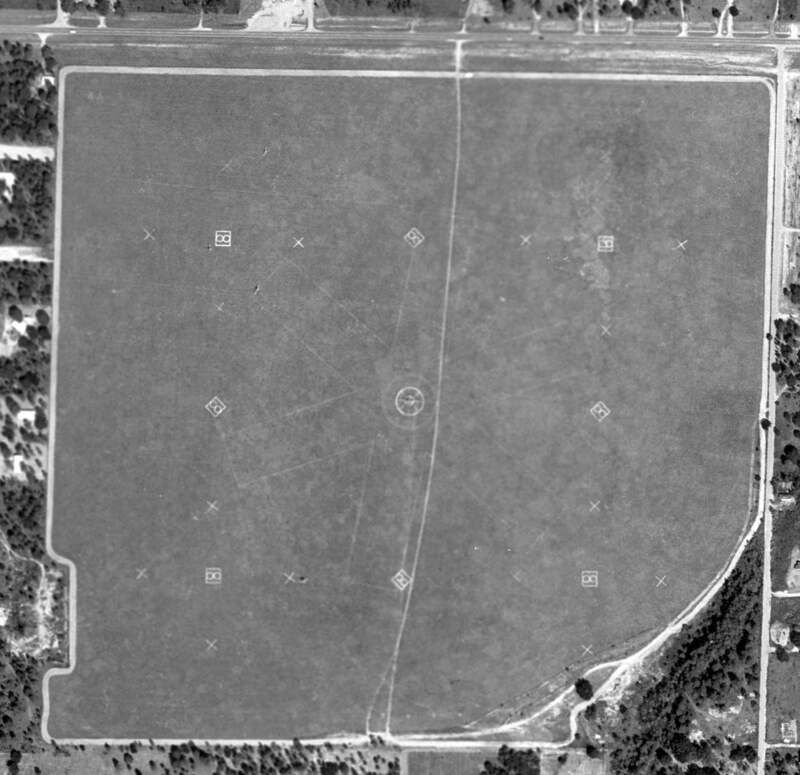 The earliest photo of Lyons Field which has been located was a 1/4/51 USDA aerial view (courtesy of Dallam Oliver-Lee). 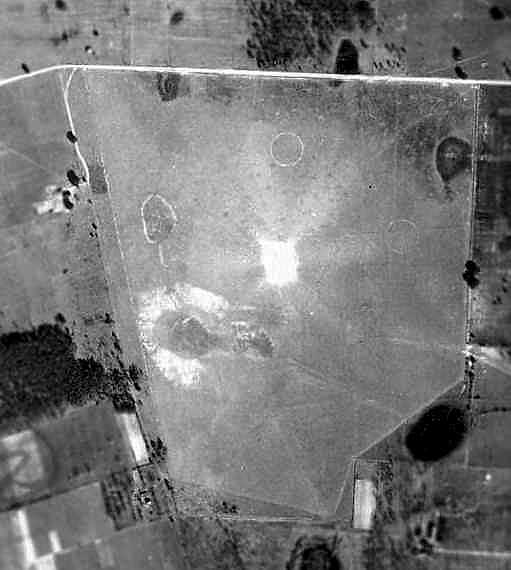 It depicted Lyons Field as an irregularly-shaped grass field, with an airfield circle marking in the center. The last aeronautical chart depiction which has been located of Lyons NOLF was on the February 1955 Mobile Sectional Chart. It depicted “Lyons OLF (Navy)” as having a 2,500' unpaved runway. 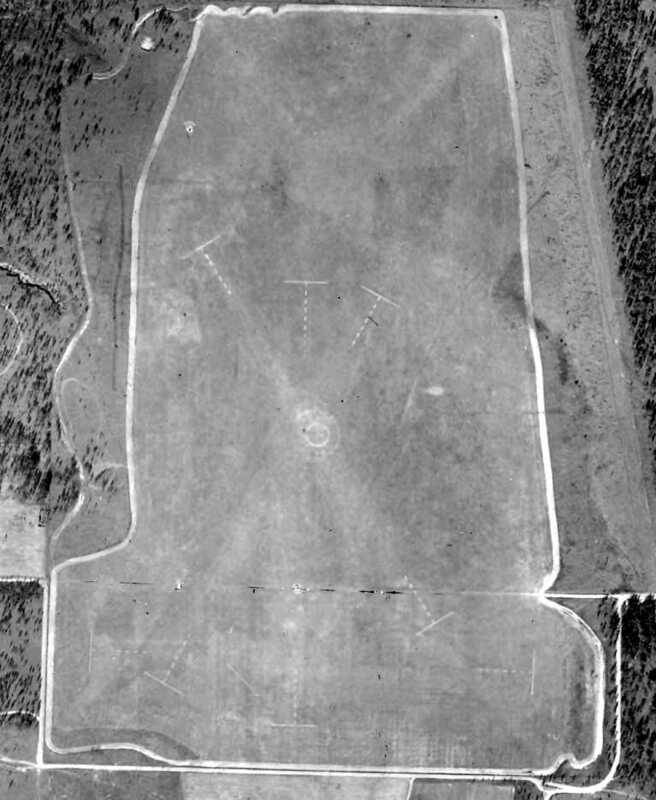 A 10/22/55 USDA aerial view (courtesy of Dallam Oliver-Lee) depicted several runways laid out along Lyons Field. 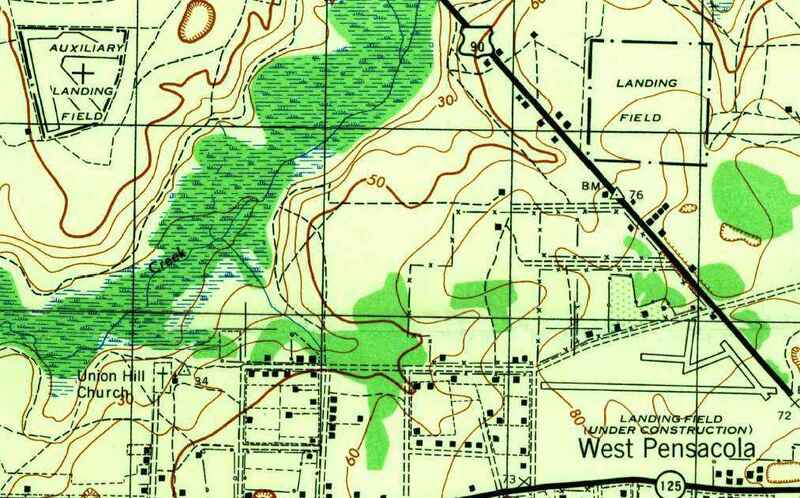 Lyons Field was not depicted on the 1956 USGS topo map. 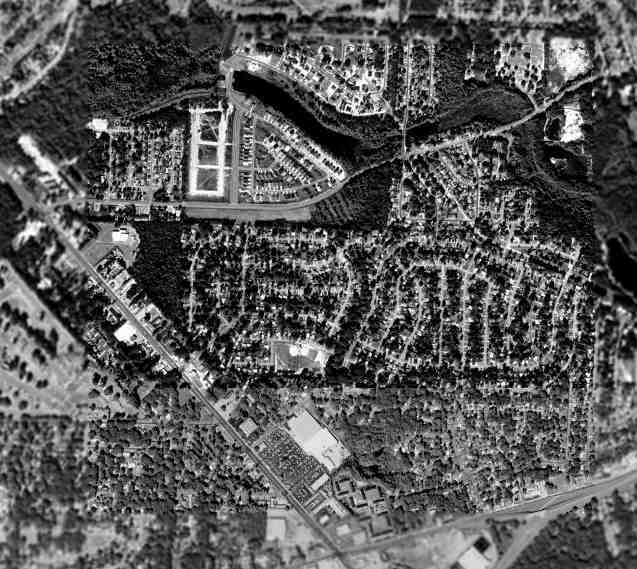 was a 1/3/58 USDA aerial view (courtesy of Dallam Oliver-Lee). Markings for 3 runways were prominent on the field. as it was no longer depicted on the March 1960 Mobile Sectional Chart. A 2/10/74 USDA aerial view (courtesy of Dallam Oliver-Lee) showed Lyons Field reused for farming. A 12/25/95 USGS aerial view (courtesy of Dallam Oliver-Lee) still showed Lyons Field reused for farming. An 11/30/04 aerial view (courtesy of Dallam Oliver-Lee) showed 3 ponds having been constructed on the west side of Lyons Field. but housing was being built over the former airfield. The site of Lyons Field is located north of the intersection of West Quintette Road & Meeting Street. 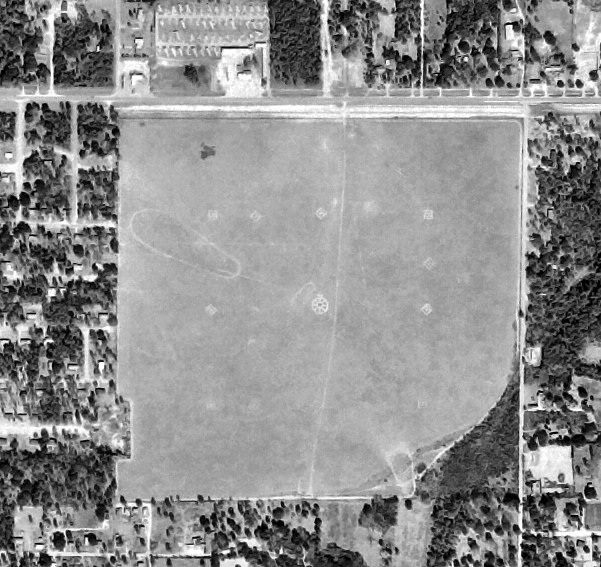 "Y Field", as depicted on a 1939 map of NAS Pensacola & its satellite fields (courtesy of Brian Rehwinkel). in the late 1930s to support flight training operations at the Pensacola Flight School. 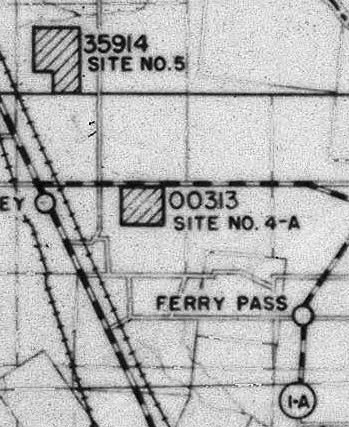 This suggests the use of this field began in 1934 or earlier, although the use may not have been through a formal lease. Navy records indicate the field was first formally leased in July 1937 for use as an outlying field. Y Field was not listed in The Airport Directory Company's 1937 Airports Directory (courtesy of Bob Rambo). 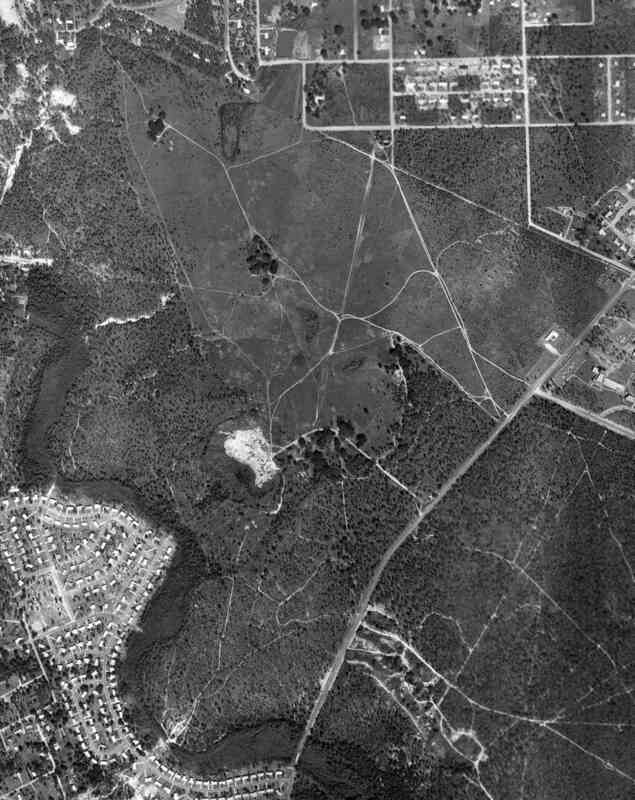 was on a 1939 map of NAS Pensacola & its satellite fields (courtesy of Brian Rehwinkel). and it was extremely small for a Navy airfield, even for an auxiliary field in the 1930s. from the Digital Library Center / University of Florida George A. Smathers Libraries (courtesy of Brian Rehwinkel). and there did not appear to be any buildings or other aviation facilities associated with the field. depicted Y Field as an empty unlabeled rectangular area. showing a biplane flying low over the field. 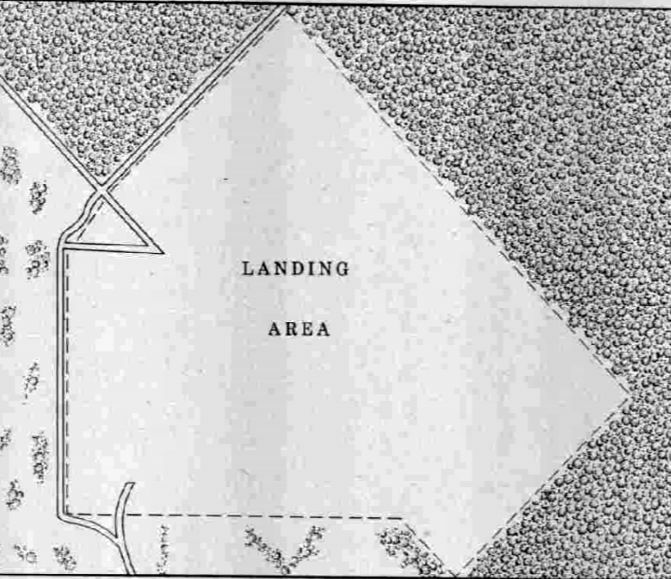 The 1944 USGS topo map depicted Y Field (at the top-right) as a square unpaved landing area, labeled as “Landing Field”. as that is how it was labeled on the January 1945 Mobile Sectional Chart. as a 90 acre squared-shaped property having a 1,980' square turf all-way landing area. The field was not said to have any hangars, to be owned by private interests, and operated by the Navy. Brian Rehwinkel reported, “The field was used until 1945, at which time the lease was allowed to expire. 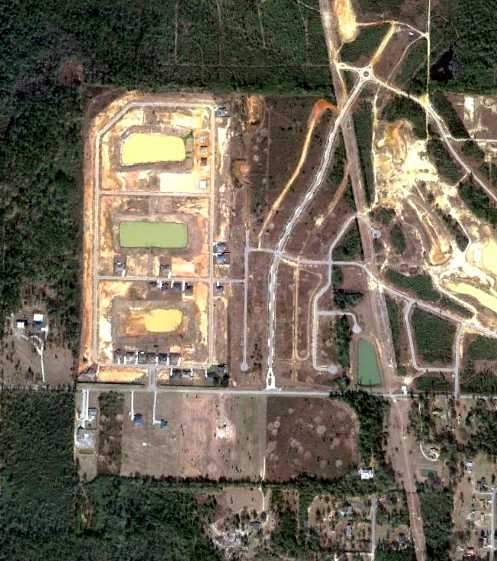 The lease for the field does not show up on a 1946 list of leases for the Naval Air Training Bases, Pensacola. Y Field / Field 35307 was no longer depicted at all on the 1949 Mobile Sectional Chart (courtesy of John Voss). 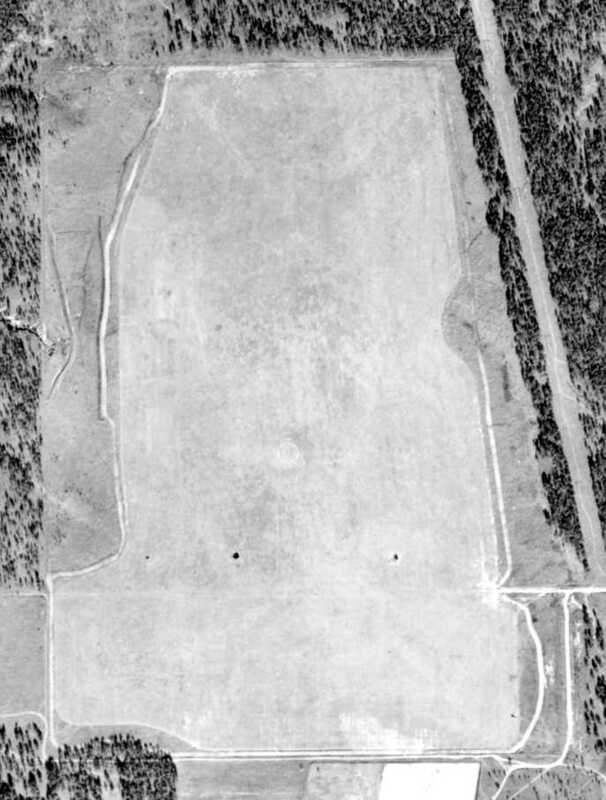 A 1951 aerial view showed the field remained intact, but showed no sign of any recent aviation use. 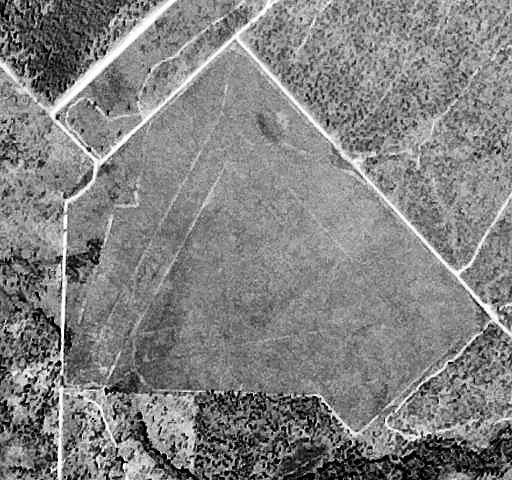 A 10/22/55 USGS aerial photo (courtesy of Dallam Oliver-Lee) showed houses covering most of the Y Field property. showing that housing had been built over the former airfield at some point between 1951-58. 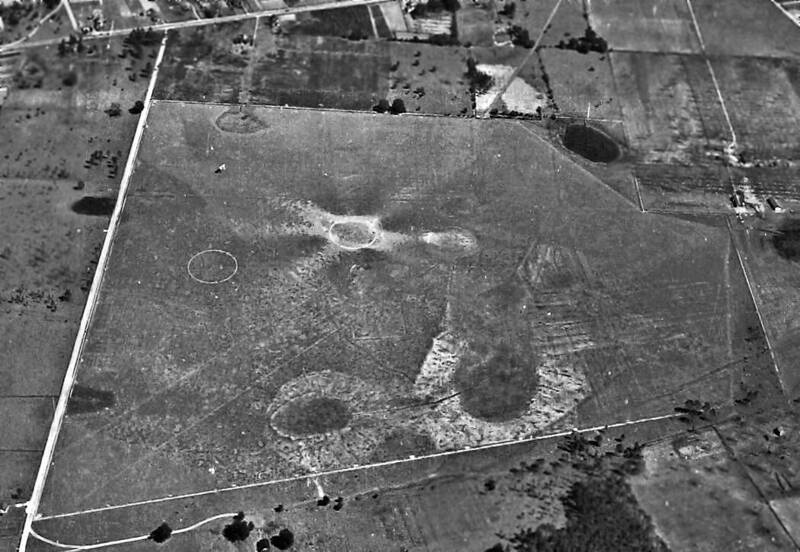 The outline of the airfield was still very recognizable, though. and not a trace appears to remain of the former Navy airfield. A 3/29/16 aerial view by Dallam Oliver-Lee looking south at the site of Y Field. 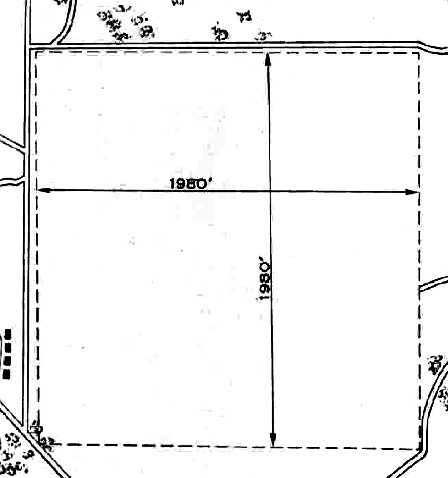 The site of Y Field is located north of the intersection of Route 90 & Wabash Avenue. 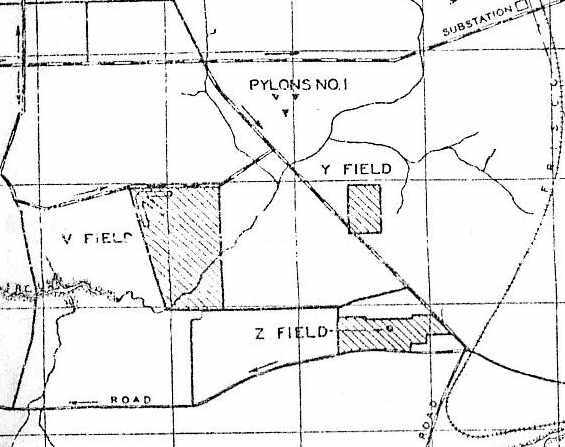 "Z Field", as depicted on a 1932 Navy plat of “Properties Comprising Z Field” (courtesy of Brian Rehwinkel). to support flight training operations at the Pensacola Flight School. 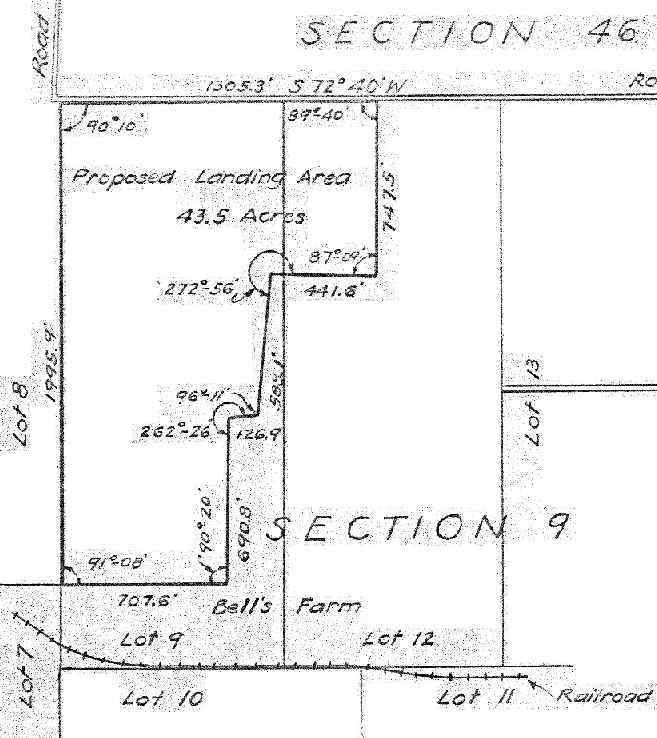 (from three different land owners) for Z Field in late 1929.
was on a 1932 Navy plat of “Properties Comprising Z Field” (courtesy of Brian Rehwinkel). and 107 acres were owned by L. Daniel. 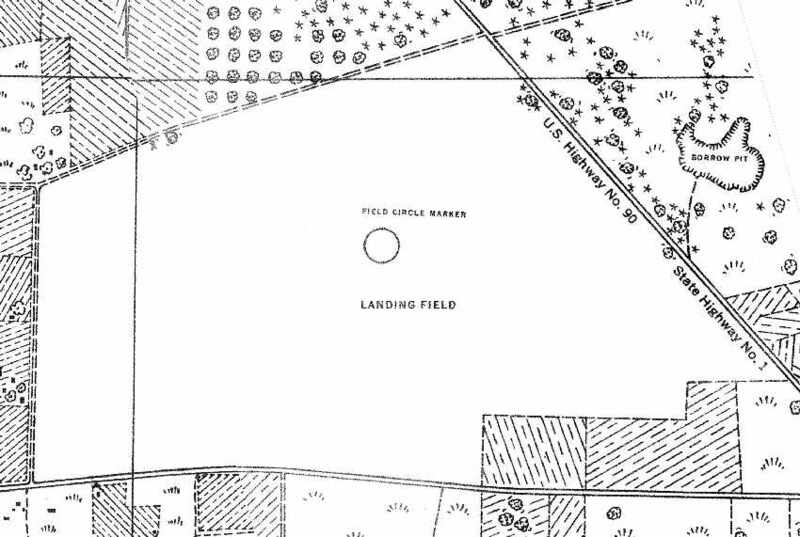 depicted Z Field simply as a “Landing Field” with a “Field Circle Marker” in the middle. No buildings or other airfield features were depicted. "Z Field", as depicted on a 1939 map of NAS Pensacola & its satellite fields (courtesy of Brian Rehwinkel). The airfield consisted of a large open grass area, within which were visible 5 runways. There did not appear to be any buildings or other aviation facilities associated with the field. According to Brian Rehwinkel, Z Field was apparently abandoned by the Navy at the beginning of World War Two. The Navy apparently canceled the lease(s) sometime in 1941 or early 1942.
a June 1942 map of Outlying Fields for NAS Pensacola, nor on the 1943 USGS topo map. which depicted a fairly complex airfield configuration of no less than 5 runways, labeled as “Landing Field (Under Construction)”. or depicted on the February 1945 Mobile Sectional Chart (courtesy of Chris Kennedy). although a drive-in theater had been built at some point between 1941-51 on the southeastern corner. 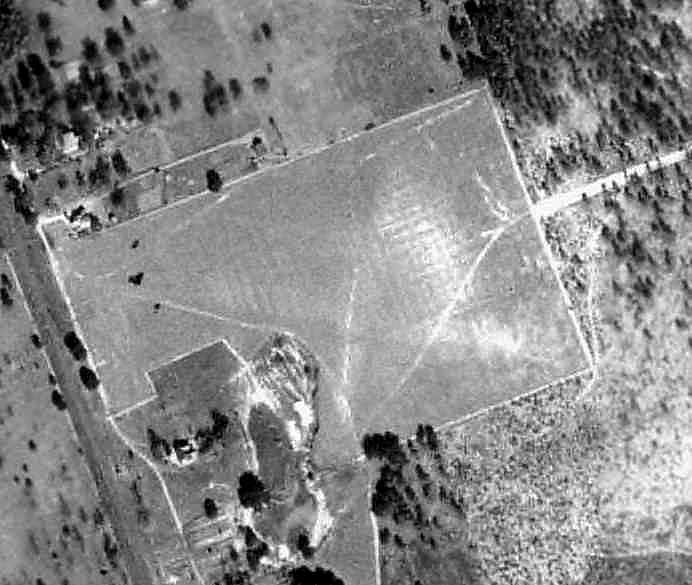 A 10/22/55 USGS aerial photo (courtesy of Dallam Oliver-Lee) showed that housing had covered the southern half of the property. 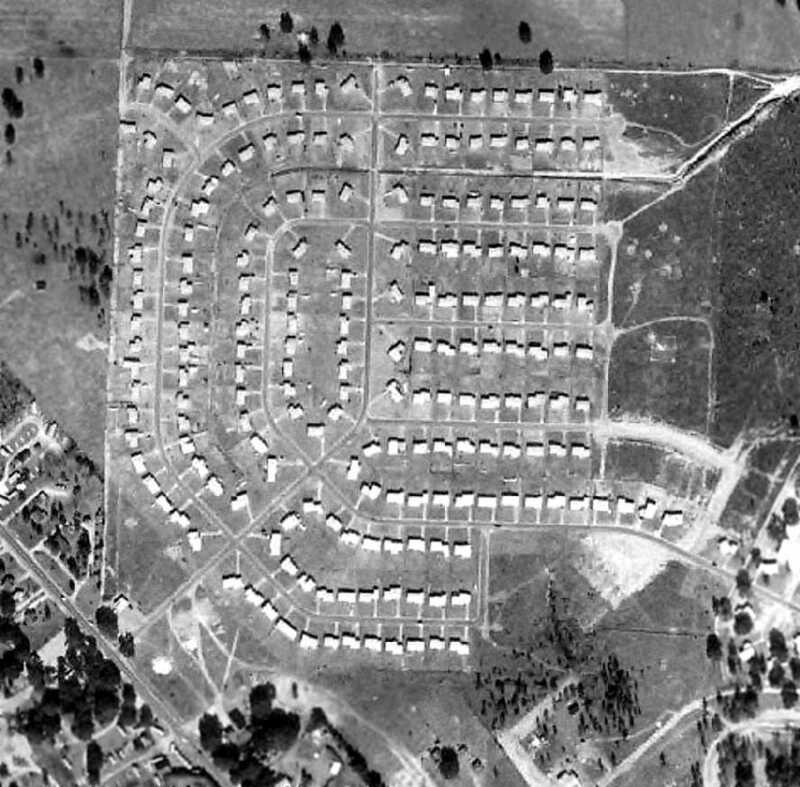 A 1958 aerial view showed that housing had covered the remainder of Z Field. 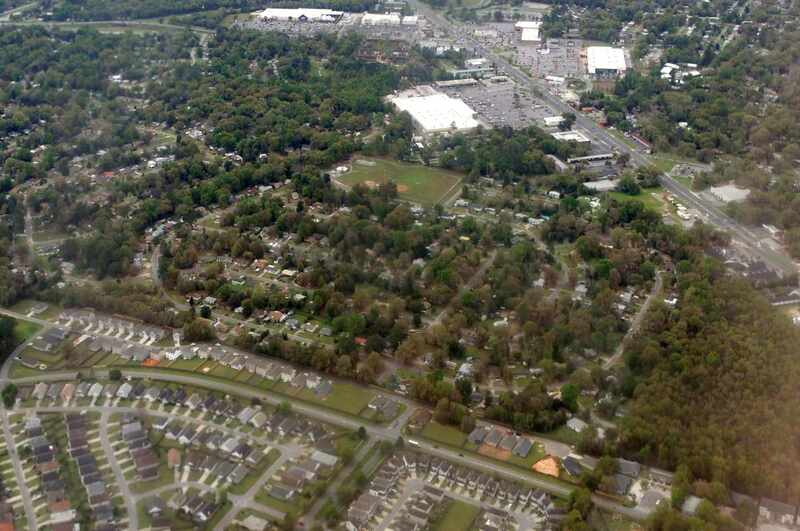 As seen in a 2018 aerial photo, Route 295 had been constructed through the eastern portion of the site of Z Field, which has otherwise been densely redeveloped with housing. Not a trace appears to remain of the former Navy airfield. The site of Z Field is located west of the intersection of Route 90 & Route 295. 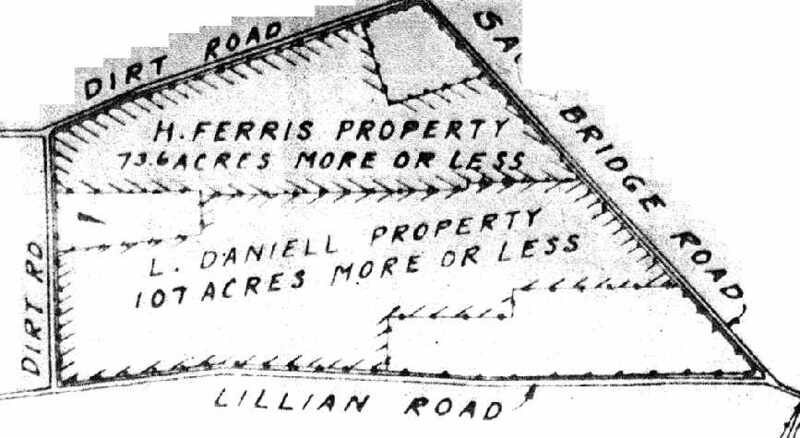 A 2/19/35 plat plan of the "Proposed Landing Area" on Bell's Farm (courtesy of Brian Rehwinkel). 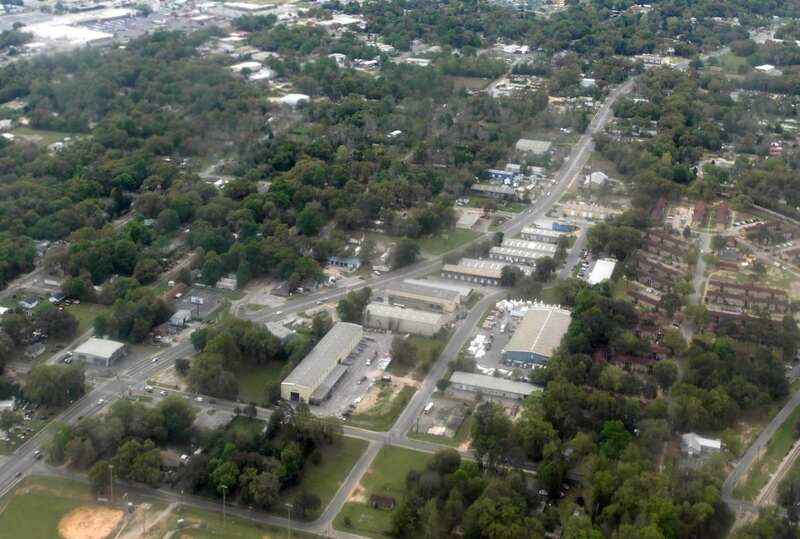 which were established to support flight training in the Pensacola area. The date of establishment of Bell's Field has not been determined. It was not yet depicted on the 1934 Navy Aviation Chart V-242 (courtesy of Chris Kennedy). 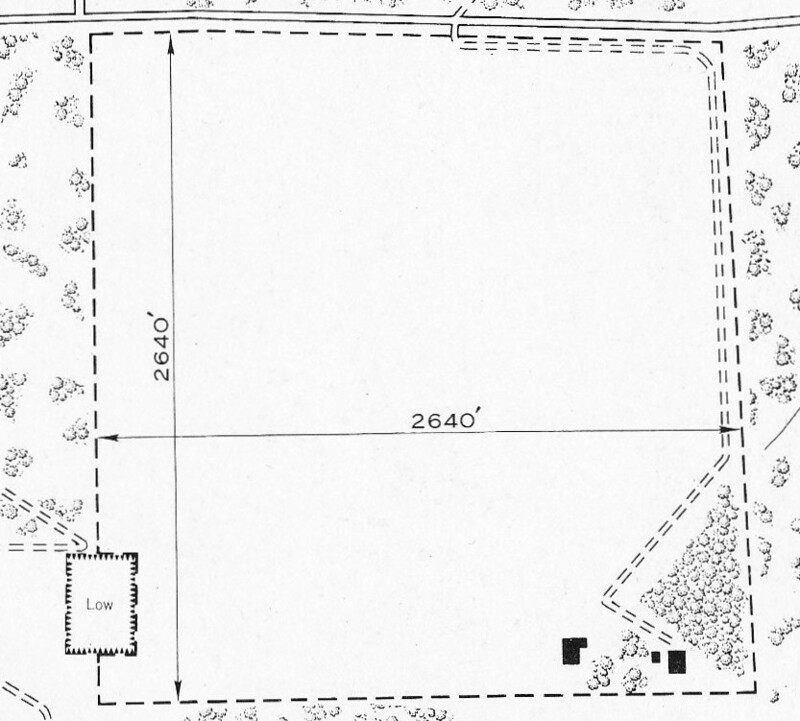 The earliest depiction of Bell's Field which has been located was on a 2/19/35 plat plan (courtesy of Brian Rehwinkel). It depicted a 43.5 acre "Proposed Landing Area" on Bell's Farm. the Navy used many of the outlying fields without owning or leasing the property. Ostensibly, they had the (probably written) permission of the owners. According to Brian Rehwinkel, Bell’s Outlying Field was one of approximately 12 "auxiliary landing fields"
(later called outlying fields) the Navy was using for training purposes by 1935.
often consisting of simple clearings, with relatively small landing areas. stating, "This field has been in use under no agreement, so far as can be ascertained." It depicted Bell's Field as an irregularly-shaped plot of land. 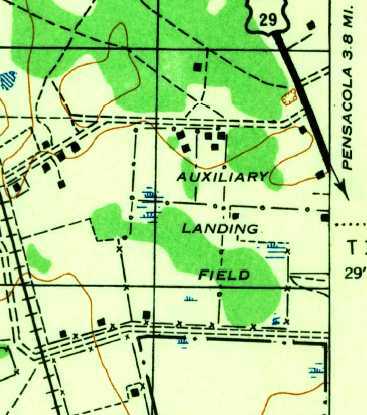 "Bell Field", as depicted on a 6/30/42 Map of Outlying Fields for NAS Pensacola (courtesy of Brian Rehwinkel). 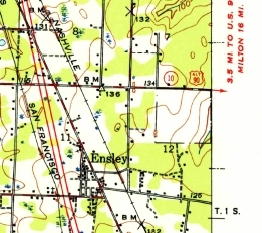 Bell's Field was not depicted at all on the 1944 USGS topo map. "Bells (Navy)" was still depicted as an active airfield (along with many others!) on the January 1945 Mobile Sectional Chart. cutting across the field (according to Brian Rehwinkel). with not a trace appearing to remain of the former Navy airfield. A 3/29/16 aerial view by Dallam Oliver-Lee looking south at the site of Bell's Field. The site of Bell's Field is located south of the intersection of Massachusetts Avenue & Franklin Avenue. 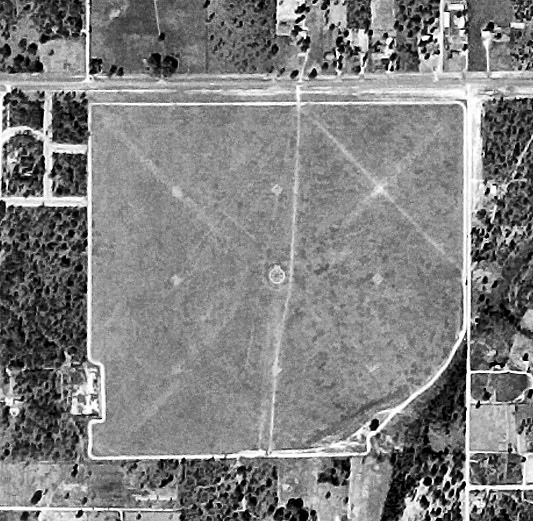 "Stump Field", as depicted on a 1939 map of NAS Pensacola & its satellite fields (courtesy of Brian Rehwinkel). According to Brian Rehwinkel, Stump Outlying Field was first leased by the Navy in July 1930. 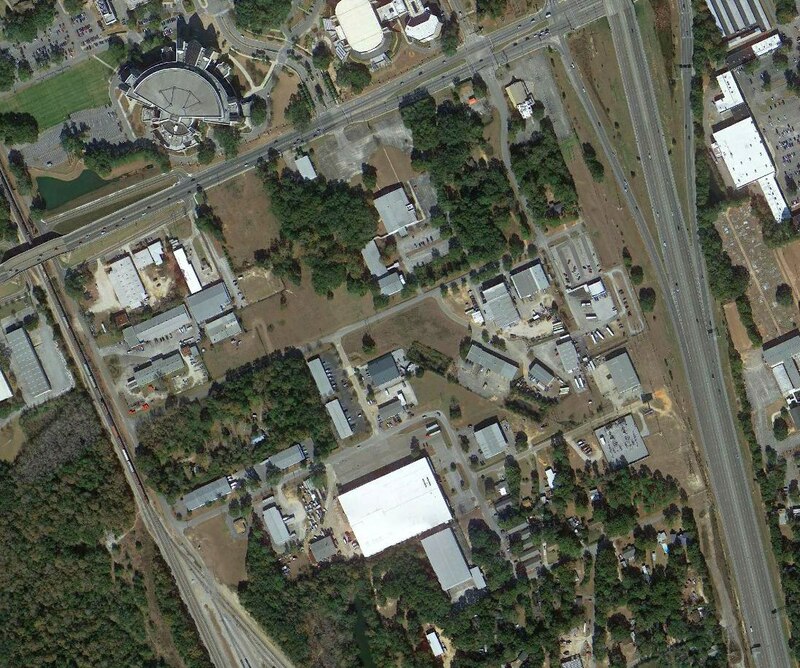 The Navy leased 150 acres from the Wilson-Bear Realty Company for the sum of $50 / year. Stump Field was one of approximately 6 "auxiliary landing fields"
(later called outlying fields) the Navy was using for training purposes by 1931. This field was a prime example of the early training fields - a primitive, sod field. the Navy (according to a May 1932 Navy memo) negotiated a reduction of the annual rental to $25 / year. on the 1934 Navy Aviation Chart V-242 (courtesy of Chris Kennedy). It depicted Stump Field as an irregularly-shaped plot of land. By 1939, the annual rental for the 150-acre Stump Field property had "ballooned" to $75! The 1941 USGS topo map (courtesy of Dallam Oliver-Lee) depicted Stump Field as an empty unlabeled area. "Stump Field", as depicted on a 6/30/42 Map of Outlying Fields for NAS Pensacola (courtesy of Brian Rehwinkel). being that it was located almost due north (005 degrees on the compass) and 9 miles from its parent field. showing one biplane on the field (top-left). 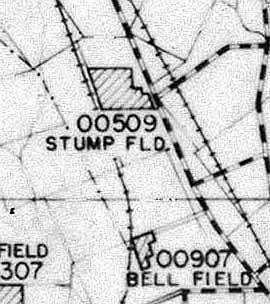 The 1944 USGS topo map depicted Stump Field as an irregularly-shaped property outline, labeled as “Auxiliary Landing Field”. 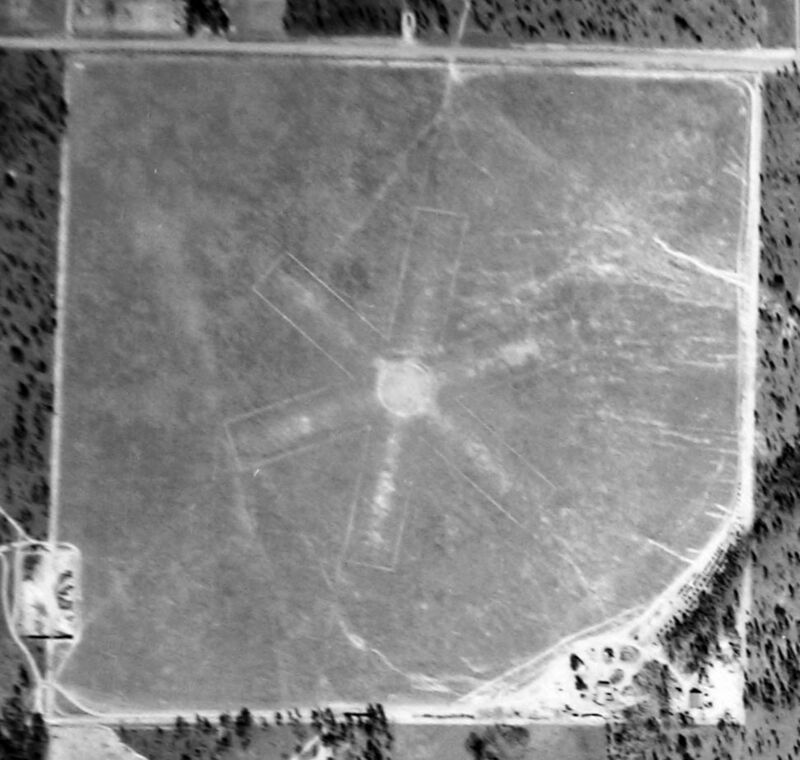 There were several buildings depicted within the property outline, but it is not known if these were directly related to the airfield. "Stump (Navy)" was still depicted as an active airfield (along with many others!) on the January 1945 Mobile Sectional Chart. as it was no longer depicted at all on the 1949 Mobile Sectional Chart (courtesy of John Voss). showed that U.S. Highway 29 had been recently built right through the center of the former Stump Field. The site of Stump Field is located at the intersection of Route 29 & Stumpfield Road - pretty tricky, huh? "Clay Pits" NOLF, as depicted on a 1939 map of NAS Pensacola & its satellite fields (courtesy of Brian Rehwinkel). in the 1930s to support flight training operations at the Pensacola Flight School. It was evidently named for the clay pits which still sit just to the south of the site of the airfield. 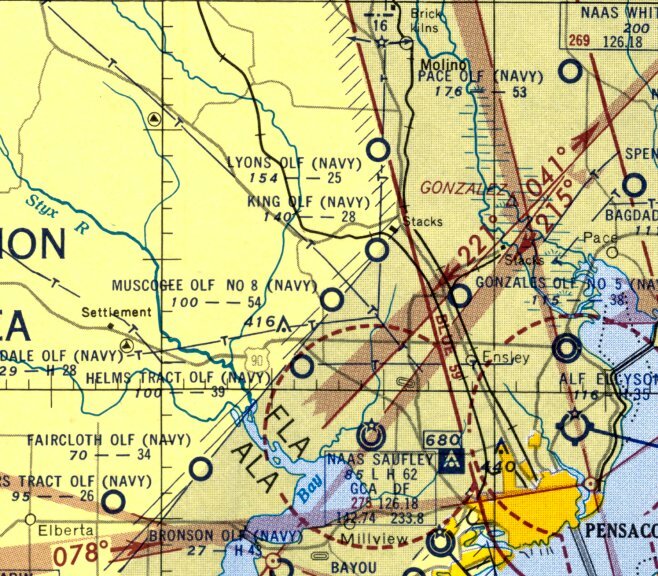 Clay Pits NOLF was yet not depicted on the 1934 Navy Aviation Chart V-242 (courtesy of Chris Kennedy). Clay Pits Outlying Field was first used by the Navy as early as 1934. It was used for "emergency precision landing instruction". Clay Pits NOLF was yet not depicted on the August 1935 Mobile Sectional Chart. During the first years of use, the Navy had no formal agreement with the owners of the property (L & N Railroad). Apparently it wasn’t until September 1939 that the Navy had a formal lease to use the tiny 23 acre property as a landing field. The Navy leased the property for $150 / year. from the Digital Library Center / University of FL Smathers Libraries (courtesy of Brian Rehwinkel). Clay Pits NOLF was only used for a short time during World War Two. the Navy informed L & N Railroad they had decided to terminate the lease, effective 6/30/42. as the heavier aircraft used for training during WW2 required longer runways. the 1944 USGS topo map, or the February 1945 Mobile Sectional Chart (courtesy of Chris Kennedy). showed that the site of Clay Pits OLF was beginning to be covered by unrelated buildings. The site of Clay Pits NOLF is located east of the intersection of Brent Lane & Sycamore Drive. 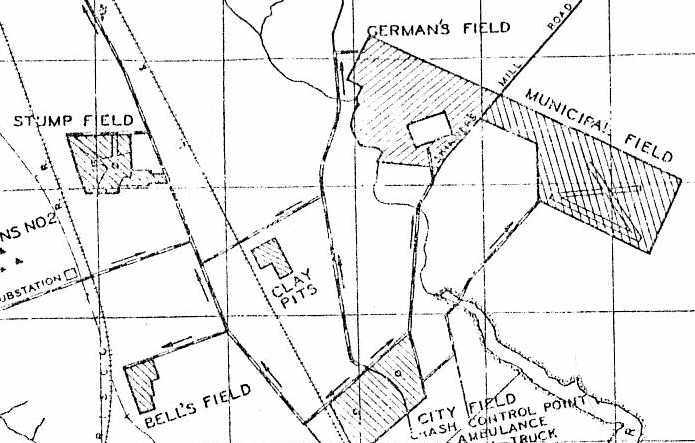 "German's Field", as depicted on a 1939 map of NAS Pensacola & its satellite fields (courtesy of Brian Rehwinkel). The date of establishment of German's Field has not been determined. nor in The Airport Directory Company's 1937 Airports Directory (courtesy of Bob Rambo). 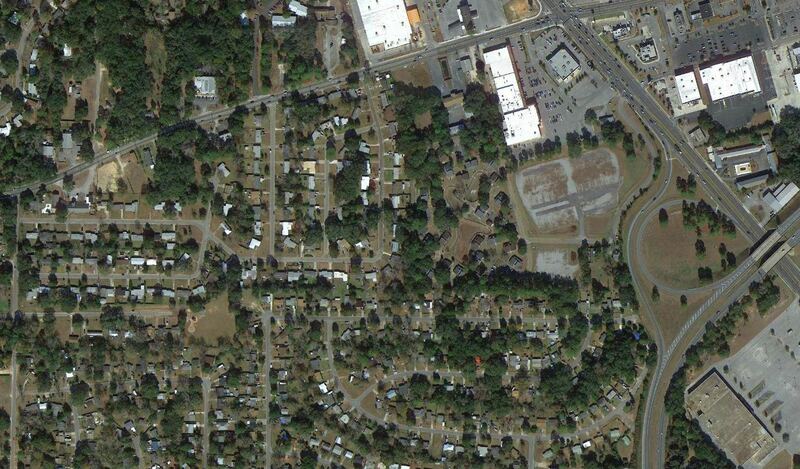 directly across Skinner's Mill Road (to the west) from Pensacola Municipal Field. It has not been determined how much longer German's Field was used by the Navy. or depicted on the 1944 USGS topo map or the February 1945 Mobile Sectional Chart (courtesy of Chris Kennedy). as air traffic became increasingly dense in the Pensacola area during the WW2 years. but did not show any indication of aviation use. 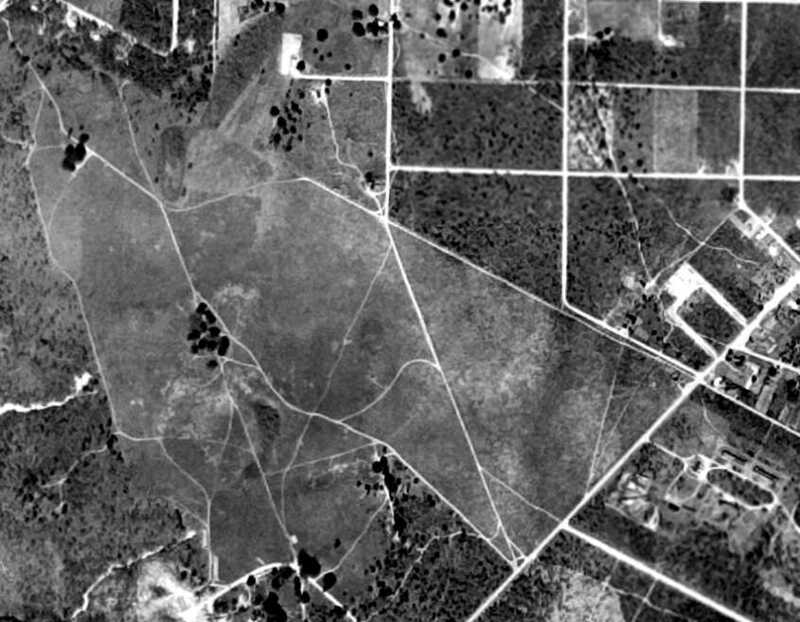 A 10/12/61 FLDOT aerial view (courtesy of Dallam Oliver-Lee) still showed the irregularly-shaped outline of German's Field. 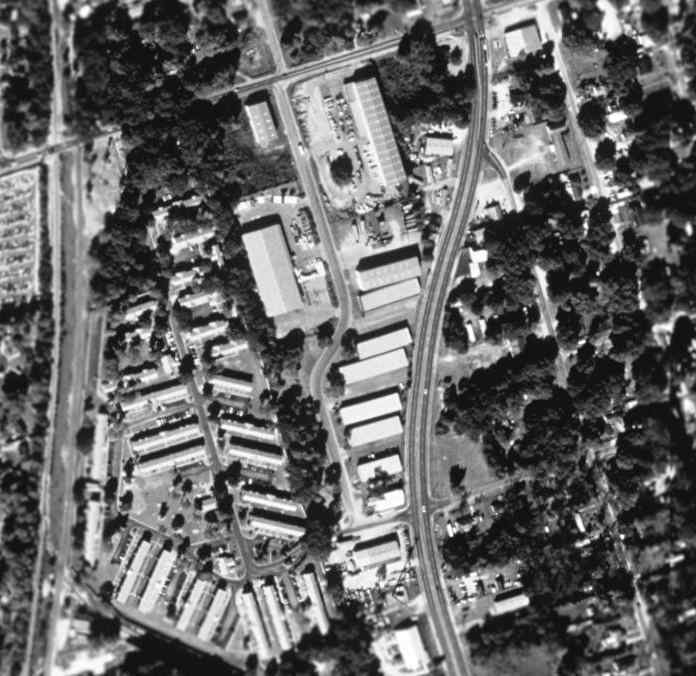 A November 1979 aerial view (courtesy of Dallam Oliver-Lee) showed commercial buildings having been built over the eastern portion of German's Field. The site of German's Field is located west of the intersection of Route 289 & Underwood Avenue.